I'll start a reading group in January on Vladimir Nabokov's Pale Fire. Eric Wagner and I have been talking about that for awhile; the book influenced RAW's use of footnotes in The Widow's Son. I meant to start that up this year, but if we begin now, we'll run into the holiday season, when people tend to be pretty busy. I don't really know how many people will participate, but Eric has promised to take part! I've read Nabokov since high school, and I like to read another of his every couple of years or so; I finally read Ada earlier this year. Coincidance is the next scheduled book to be published by Hilaritas, and then the Historical Illuminatus books, which would be suitable subjects for the next series of reading groups. 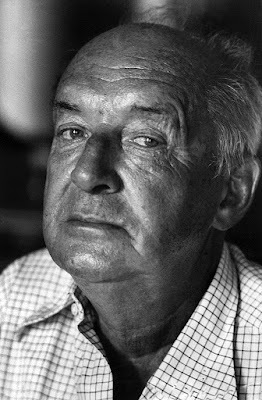 I've never read Nabokov but have been wanting to--mainly because I've seen him mentioned on this site more than a few times... I'm in! Wasn't RAWs use of footnotes also influenced by Flann O'Brien?. The Widows Son was written in Ireland and Raw often used to quote the De Delby character, who appears in footnotes in The Third Policeman. Yes, O'Brien certainly influenced him as well. I look forward to Nabokov in 2018. I'd love to partake in this. Just acquired a copy of Pale Fire.